The Erongo Region offers some of the most spectacular and popular tourist destinations as well as a variety eco-, wildlife, cultural and adventure tourism opportunities. Swakopmund in the Erongo Region together with Namibia’s capital Windhoek (Khomas Region) will from 26 to 31 October 2013 host the Adventure Travel World Summit (ATWS). This will be first hosting of this world event in Africa since its inception on 2006. Namibia won the bid to host the event against eight other countries. When visiting the Erongo Region you would most probably experience the Namib Desert, when visiting Swakopmund, Walvis Bay or Henties Bay. The Namib Desert is considered to be the oldest desert in the world. The highest mountain in Namibia, the Brandberg with its famous rock painting ‘The White Lady’, and the characteristically shaped Spitzkoppe Mountains and the very old Messum crater are some of nature’s monuments in the northwest of the region. The region is home to the Dorob National Park between the Kuiseb Delta, south of Walvis Bay, and the Ugab River in the north. A part of the Namib-Naukluft Park covers its southern border, where one also finds the ephemeral Kuiseb River and the Topnaar people, who make their living off from what the Namib Desert offers. Some of the most unique flora such as the Welwitschia plant that can become as old as two thousand years, and a huge variety of lichens, living fossil plants that live from the coastal fog. Various other creatures, large and small are also living in the desert near the coast. The small ones include the Palmato Gecko, Fitzsimons burrowing skink, Shovel-snouted lizard, Fog basking beetle, White lady spider and the Namaqua chameleon. Larger animals such as Oryx, Zebra, Springbok and Ostriches can be found at the coast, and the occasional Desert elephant and lion at places such as the Messum Crater. 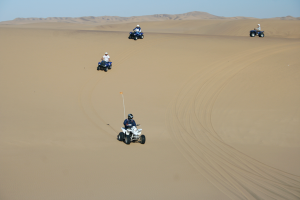 The holiday and tourist resort of Swakopmund, the Dune Belt to its south, the Moon Landscape to the east, desert eco-tourism trips and various adventure sports activities, make this area one of the most popular destinations in Namibia. A variety of hospitality establishments such as hotels, lodges, guesthouses cater for tourists and holidaymakers. 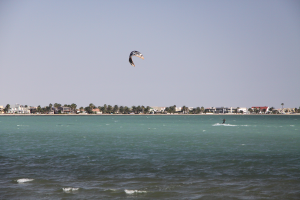 At the port town of Walvis Bay, 40 km south of Swakopmund, one finds the two RAMSAR birds sites of Walvis Bay Lagoon and about 30 km further south, Sandwich Harbour. Marine boat tours are undertaken from Walvis Bay and the Benguela Dolphin, Seals, Pelicans, Sunfish and the occasional Southern Right Whale can be spotted. Henties Bay 70 km north of Swakopmund is another holiday town, which anglers like due to the good beach angling along the coast. North of Henties Bay one can visit the Cape Cross Seal Reserve with its thousands of Cape Fur Seals. Inland a variety of private game reserves, hunting farms, lodges and guest farms offer the tourist the wildlife and the African experience they come to expect in Namibia. Erindi Game Reserve with its 79,000 ha and more than 20,000 animals, on the eastern border of the Erongo Region, is the largest private game reserve in Namibia. To the northeast and west of the Erongo Region, you find small-scale miners who make a living from semi-precious stones, which they sell at roadsides or to shops. Part of the Erongo Region, are four communal conservancies, which offer tourism opportunities, livelihoods and other benefits to people from communal areas. The conservancies are: Otjimboyo with the Ugab River valley as its most important feature; Tsiseb, with the Brandberg and its rock painting; ≠Gaingu operating the Spitzkoppe Rest Camp and Spitzkoppe Monument Area; Ohungu, also operating along the Ugab River. A variety of wildlife can be seen in the conservancies, among which are Elephant, Black Rhino, Leopard, Cheetah, Oryx, Kudu and Springbok.